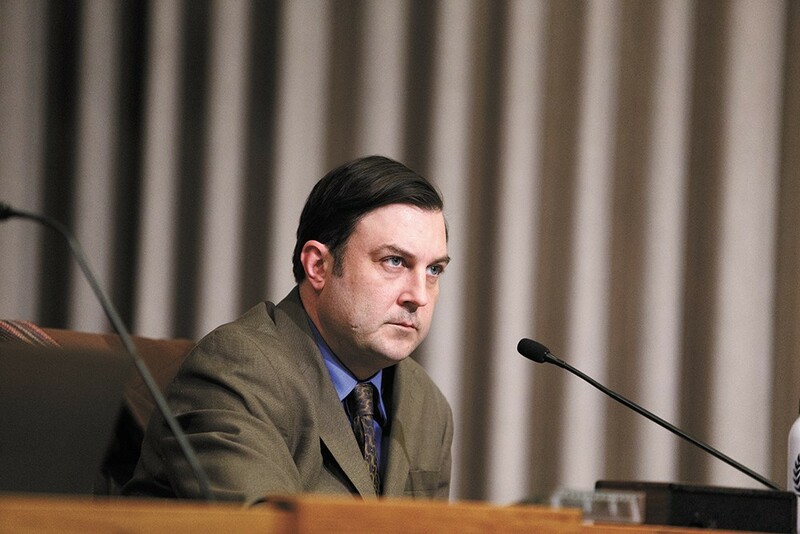 The Spokane City Council led by Council President Ben Stuckart hopes to improve how future police ombudsmen candidates are found. The Spokane City Council passed an ordinance on Monday aimed at fixing what's widely acknowledged as a flaw of the city's police oversight system: It's been without a police OMBUDSMAN for nearly a year after Tim Burns' resignation, and there is no clear mechanism to install an interim ombudsman. The new ordinance, which would create a process to appoint an interim ombudsman should the position become vacant, passed unanimously, but it first needs to be negotiated with the Spokane Police Guild before it can be fully implemented. Negotiations with the Guild aren't expected to begin until next year. "So we've been without a police ombudsman, and it laid bare a pretty big flaw in our ordinance, which is that we don't have a good way to ensure there's an interim police ombudsman should there be a sudden vacancy in the position," said Councilman Jon Snyder, the sponsor of the ordinance, at the council meeting. In May, the city council passed a resolution calling on the Ombudsman Selection Committee to send the Office of Police Ombudsman Commission, which oversees the office, a list of three candidates that could be used to build a pool of interim candidates. However, the resolution went largely ignored. In Idaho, unlike in Washington state, the only way to opt out of the state's Smarter Balanced tests is to disenroll entirely from the public school system. Yet Idaho has been much quicker to waive the tests from its graduation requirements. At an Idaho State School Board meeting on Monday, the board unanimously voted to waive all SMARTER BALANCED test requirements for the Class of 2017 — this year's juniors. State Board President Don Soltman says one issue was that the Smarter Balanced tests assumed that students were 11th graders. But Idaho offers its state tests in ninth and 10th grades. As a result, the state has had to offer a customized Smarter Balanced test or risk testing their students on material they've never been taught. "We didn't think it was fair," Soltman says. The waiver follows decisions in October to waive the Smarter Balanced graduation requirement for sophomores, and to not require freshmen to take the test at all this year. Still, the discussion over testing isn't over yet. "We're going to devote most of next Wednesday's board workshop to the topic of testing," Soltman says. A woman was found walking along Highway 53 on Nov. 25 in KOOTENAI COUNTY bound in duct tape. The 25-year-old from Washington was abducted from Broadway Foods in Spokane, according to the Kootenai County Sheriff's Department. She was taken to near Rathdrum and was physically assaulted by three people, authorities say. Three suspects, all from Coeur d'Alene, were identified as Travis Anderson, 27, Angela Frisby, 37, and Lilly Johnson, 19. Anderson had previously been charged with attempted strangulation and Frisby with battery. Johnson did not have a criminal record. The abducted woman escaped the same day she was taken after the three suspects left. Several people stopped to help when she was seen on the highway near Hidden Valley Road.